Two bedroom apartment with shared swimming pool and patio, 200 meters to the beach. This beautiful spacious 2 bedroom apartment with its lovely terrace area with patio and air conditioning throughout is the perfect choice for your holiday in Cyprus. The apartment is situated in a prime location of Pernera, a stones throw from the beach. Located less than a minutes walk to the streets filled with shops, bars and restaurants, to suit all tastes and ages. The beach bar and restaurant on site hosts a large communal pool, jacuzzi and a children's pool that can be used free of charge by our quests. There are also sun loungers that can be used by our quests free of charge. Two bedroom apartment with the master bedroom with a king size bed with bedside cabinets, with patio door to terrace area, and the other bedroom have twin beds and also plenty of cupboard space. The apartment is fully furnished and equipped with all modern appliances such as flat TV, DVD player, stereo CD player, microwave oven, dishwasher, full size refrigerator, washing machine, toaster, kettle and all necessary kitchenware. All necessary bed linen and towels are provided free of charge. The beach bar and restaurant on site hosts a large communal pool, jacuzzi and a children's pool, the bar also has sun loungers for your use free of charge. There is plenty to do for all ages and interests. There is a fantastic water park 400 meters from the apartment and a bigger one in Ayia Napa. The apartment is a 5 minute drive or a 20 minute walk along the beautiful seafront promenade to the lively resort of Protaras center. House keeping and additional services are available on request. This two bedroom apartment is located in one of the most attractive resorts of Cyprus namely Pernera in Protaras-Ayia Napa area near Paralimni Village. A couple of minutes walk you will find the holiday village of Kapparis with bars, excellent taverns and restaurants, supermarkets, bank, kiosks and car hire rental offices. 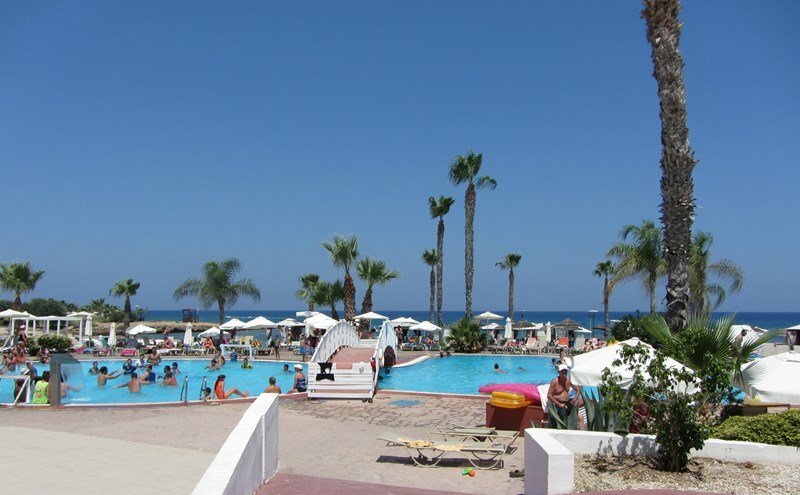 Larnaca airport is about 40 minutes drive from the apartment. There is a National Park Forest in the area at Cape Greco, occupying an area of 390 hectares and offers facilities for hiking, picnicking, cycling, horse-riding, climbing, swimming and diving. Scenery and views in this area are some of the best on the island. Approximately 5 minutes drive along the coast is the family friendly coastline resort of Protaras with its famous white sandy beaches and, in particular, Fig Tree Bay where you can find activities such as snorkeling, jet-skiing, parasailing plus Water world, where children can splash all day.